Attended the 2018 Interfaith Seminar and Dinner at City Hall, Cardiff arranged by the Muslim Council for Wales. The key note speaker was The Venerable Master Chin Kung an eminent monk of the Pure land school of Mahayana Buddhism. With some 500 present all the introductions were in both Welsh and English with representatives of all faiths attending what was a memorable evening. Presentations were made to several individuals; including Carwyn Jones, the First Minister, for their contribution to various aspects of community life in Wales. Gave a talk about the work of the FCCW to the Glamorgan – London Presbytery of PCW held at Port Talbot. Attended the launch of “Dock of the Bay” , at the Exchange Hotel, which celebrated the launch of a four-part itv Wales series on the history and diverse cultures of Cardiff Bay and its dockland communities. Attended an interfaith event “Invest in Peace”/ Adeiladu Pontydd under the auspices of the Board of Deputies of British Jews and CTBI (Churches together in Britain), arranged by St David’s Uniting church Pontypridd and Cardiff Reform Synagogue. The Synagogue was nearly full with very effective presentations by two young men, the one being a Palestinian and the other an Israeli. An extremely populous meeting of the Cross part Group on Faith at Y Senedd. The topic was “Islam and Extremism” The Guest Speaker was Dr Saleem Kidwai,OBE who emphasised by many references to the Quran that Islam was for community of moderates. He showed how Islam was misunderstood and that a lot was due to media bias and ignorance. An intelligent and useful discussion ensued. Attended and presented a prayer at the National Service of Thanksgiving – Armistice 100, broadcast from Llandaff Cathedral on both BBC1 and S4C. Attended a meeting at the Welsh Government with other Faith Leaders to receive an up date and to respond to the documentation concerning Religious Education in the new curriculum. Final documentation will be available in April with a period of full consultation. It is vitally important that ALL Denominations as well as individual churches respond to that document when it is published. The future of Religious Education depends on that happening. We have to be alert to the substantial influence and demands of the “non-religious”. Our Council Meeting (FCCW) Not only was there a good attendance from members but it was augmented substantially in the morning session by Denominational officers and College lecturers with responsibility for Theological/Ministerial Training. The session was led most ably by Dr Catrin Haf Williams, University of Wales Trinity St Davids. There was a detailed and thorough discussion with everyone contributing freely. There is clearly a will to co-operate and co-ordinate among the denominations. There were a number of practical suggestions. It was agreed that Rev. 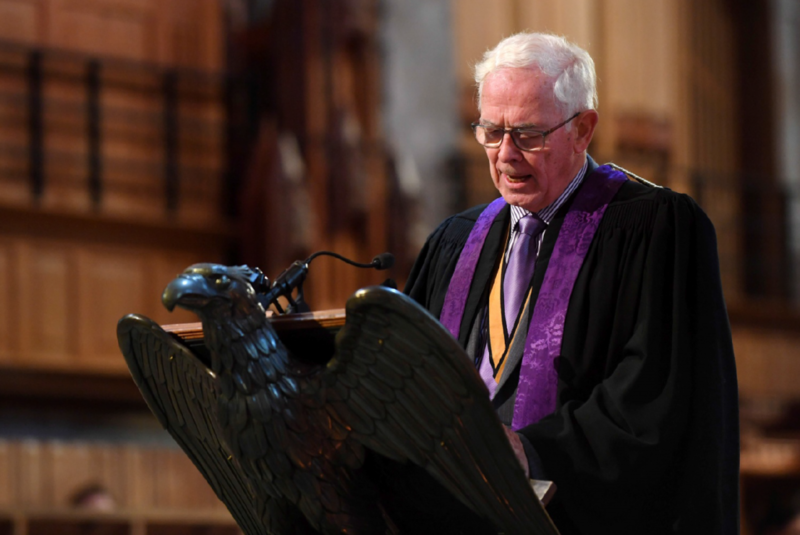 Bryn Williams (PCW) would convene a meeting of the key individuals from the denominations in early 2019 after consulting with the St Padarn’s Institute. It was also agreed that the re-establishment of the ‘ Ecumenical Validation Board ‘ would be valuable and the President expressed that he would mention this to the Archbishop of the Church in Wales the next time he met him. The need for a revision of the “Community Ministry” document produced in 2000 was noted as was a Welsh version produced by three General Secretaries in 2016 but which had not been published. Peredur Owen Griffiths agreed in his role as the Faith, Order and Witness Enabler at CYTUN to co-ordinate this work and produce a bilingual document in co-operation with the relevant groups. Expressions of thanks and joy were given for the co-operation with CYTUN especially with the development of a new web site where information about FCCW will be more obvious and much easier to find. Rev Aled Davies and Mrs Nerys Siddall (North Wales representatives); and two in a new role – the Revs Irfon Roberts and Eirian Wyn (South Wales representatives). Contributed to the discussion on the BBC programme Taro’r Post on the matter of Collective Worship in schools. The issue started with petitions some eighteen months ago and is still unresolved. We, as Christians, must be alert and vigilant if we want to preserve this part of our heritage. I was privileged to represent FCCW at First Minister Carwyn Jones’ farewell reception at Y Senedd. There were several of us representing different faith communities which was a fair reflection of the way in which Welsh Government shows its support to faith communities; with the First Minister (as indicated above) chairing the Faith Communities Forum which exists under the auspices of the Welsh Government. A Happy New Year full of blessings to all.